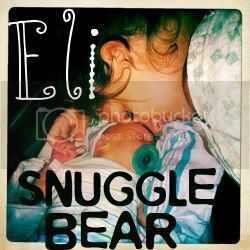 Snuggle Bear Eli: Today I have an 8 month old! Today I have an 8 month old! The pacifier clip is probably the best thing I've ever bought for Eli. Although it's not very attractive. Eli had a blast wearing different hats. He was really happy with us. :) haha..
8 months? wow! happy birthday little eli! i love eli's eyes. gorgeous! Finley has that hat, AND that binkie, TWINS!!! !